Cat’s skin inflammation, can also be referred to feline dermatitis, is cat’s immune system’s over reactive response. There are many things that can trigger cat’s skin inflammation, such as parasites like fleas and mites, bacterial infection, fungal infection, viral infection, food or contact allergy, skin cancer, trauma from bite, fight wound, or foreign object like collar, poor grooming, drug reaction, chemical or sun burn, stress that lead to over grooming, decreased of thyroid hormones, and increased of steroids. Mite and flea allergy dermatitis are the most common cause of cat’s skin inflammation. Skin inflammation is hereditary disease, it means that the cat whose parents have skin inflammation has greater chance to develop the same issue. The diagnosis of cat’s skin inflammation can only be done by the vet. The vet usually goes thorough skin examination and other examination such as flea examination, skin scraping, ear swab, faecal examination, skin biopsy, blood tests, until finally the diagnosis can be made. The vet also need a complete history of the cat’s condition, lifestyle, and environment that the cat owner must give in order to help the vet understands the issue. The main goal is to identify the cause of the skin inflammation, since the treatment of skin inflammation depends on its cause. The skin inflammation can either infectious or non-infectious, but most of it is non-infectious. The most common sign of skin inflammation in cat is scratching uncontrollably. Skin inflammation usually give the cat itchy feeling that makes it uncomfortable and lead to it scratching or scraping its body to other object like furniture. Skin inflammation can affect all parts over cat’s body, the most common parts are underarms, around the eyes, ankles, between the toes, etc. Skin inflammation can also affect cat’s paws. Any change on cat’s paw can be a sign if the cat has skin inflammation. It’s important for cat owner to know signs of skin inflammation in cat’s paws, since we need to treat the cat. By knowing the signs, cat owner can realize that the cat has problem that can be discomforting, even fatal. So here’s 3 signs of skin inflammation in your cat’s paws that every cat owner needs to know. The first of 3 signs of skin inflammation in your cat’s paws is itchy cat’s paw. Itchy paw can also be a sign of cat’s skin inflammation. The condition can be referred to pruritus or itchy skin, that can give intense itching and drive the cat mad and scratch uncontrollably the affected area. Skin inflammation can have itchy areas all over the cat’s body, including cat’s paw and face. Cat tends to scratch and lick the itchy area excessively. Excessive grooming and scratching can cause swelling and further inflammation in the area. It can even progress to hair loss and ulceration. That’s why cat owner need to pay attention to cat’s strange behavior, to realize there is any problem on the cat and prevent it to be worse. The cat may not always show the excessive grooming behavior because it tends to be secretive of its grooming. It also doesn’t mean if the cat often scratching or grooming means there is any issue. That’s why we need to examine the cat thoroughly so we don’t miss or lost any sign. 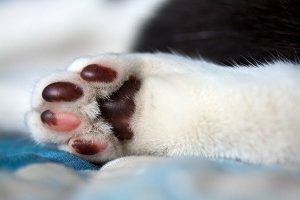 Swollen cat’s paw can be a sign that there is inflammation or allergy in cat. The issues are not limited to the paw, but can also affected other part of cat’s body, like the skin. Skin inflammation, especially the one that caused by allergy can affect all over the cat’s body, including the paw. If the cat has swollen paw, it may feel discomfort when it is walking, or even painful. It can limp or even doesn’t want to walk altogether. If we find that the cat’s paw swollen, then we may need to check all over the cat’s body and paw to find the cause of it. Swollen cat’s paw not only caused by skin inflammation but is also the result of another reason. That’s why we need to check the cat carefully. Swollen cat’s paw caused by skin allergy always affected the skin, since it is the main cause of it. It also comes with skin lesions such as red and patches skin, hair loss, etc. The third of 3 signs of skin inflammation in your cat’s paws is bump or puss filled in cat’s paw. Skin inflammation caused by allergy can also lead to forming of bump and pus filled area in cat’s paw. Although it can also mean that there is any infection in cat’s paw. That’s why we need to do comprehensive examination to the cat. Check if there is any infected injury on the cat’s paw. if there isn’t, then it probably comes from skin inflammation problem. We can also check if there is any inflammation around the nail that comes with the involvement of skin. Treatment for skin inflammation can be varied, such as washing the cat with medication product or hypoallergenic diet. The treatment depends on the cause of the skin inflammation. Beside treatment for symptoms, the treatment for the wounded skin is also needed. To heal the wounded skin, cat must not lick the wound. We may need to disinfect the wound with disinfectant such as povidone iodine twice a day to keep the wound clean and prevent infection. To prevent the cat to lick the medicine and the wound, it may be given the Elizabeth collar (E-collar). We also need to prevent cat’s skin inflammation in the future. Grooming the cat regularly and check if there is any sign of skin inflammation or anything that can cause skin inflammation. If the cat’s has skin inflammation caused by allergy, then cat owner needs to keep the cat away from the allergen and make sure that the cat’s environment is free from the allergen. Cat with skin disorder is recommended to have diet supplement with omega 3 fatty acids as it can help to decrease inflammation in cat’s body.